Pakistan is a peace loving nuclear power democratic state that fully understands her international responsibilities and never lacks behind in fulfilling them. Pakistan armed forces and citizens are highly professional. Besides defending their own frontiers, they are the world leaders in UN led Peacekeeping efforts. performance in these missions has been excellent and recognised internationally. Pakistan joined the United Nations on 30 September 1947. Quaid-E-Azam Muhammad Ali Jinnah, the founder of Pakistan. said. “Our foreign policy is one of friendliness and goodwill towards all the nations of the world. We believe in the principle of honesty and fair play in national and international dealings and are prepared to make our utmost contribution to the promotion of peace and prosperity among the nations of the world. Pakistan will never be found lacking in extending its material and moral support to the oppressed and suppressed peoples of the world and in upholding the principles of the United Nations Charter. Peacekeeping, as defined by the United Nations, is a way to help countries torn by conflict create conditions for sustainable peace. UN peacekeepers usually military officers, civilian police officers and civilian personnel from many countries monitor and observe peace processes that emerge in post-conflict situations and assist ex-combatants in implementing the peace agreements they have signed. Such assistance comes in many forms, including confidence-building measures, power-sharing arrangements, electoral support, strengthening the rule of law, and economic and social development. Many challenges of conflict zone and multicultural force . UN Peacekeeping missions cover a long of Pakistani with the United Nations. 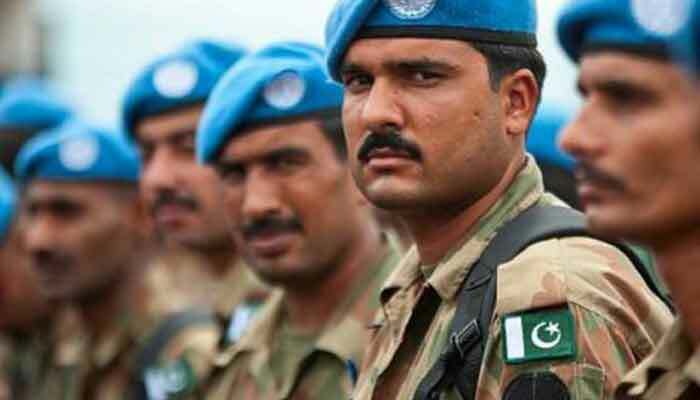 Pakistan’s support to UN peacekeeping operations began in 1960 when Pakistan deployed its first ever contingent in UN operation in Congo. Pakistan important and lead role all time in world peacekeeping mission . like Somalia no one want to go their its Pakistan done great job. The contribution of Pakistan in the United Nations peacekeeping mission in Somalia, 25 years this year, , to promote goodwill on behalf of Pakistan. Pakistan was the first country that sent troops to Somalia. Pakistan: One of the longest-serving and largest contributors to UN peacekeeping since its creation, Pakistan has played a significant role as a member of the United Nations, in bringing peace through active diplomatic, moral and material support in various regions of the world. Pakistan’s outstanding contribution to the UN peacekeeping. Pakistan continues playing its positive role being one of the highest troop contributing nation for maintaining international peace and security under the United Nations flag. Professionalism and services of Pakistani peacekeepers have been widely acknowledged worldwide by world leaders and UN leadership. Pakistan’s position as one of the largest troop contributing country in the world with one of the highest peacekeepers. Pakistan has contributed mainly military, but also paramilitary and civilian police as peacekeepers as well. All operations must include the resolution of conflicts through the use of force to be considered valid under the charter of the United Nations.Pakistani women and men currently serve in different UN operations, The Pakistani forces also provided technical and vocational skills training, including tailoring and computer literacy, for the local population, which was emerging from a brutal civil war. Pakistan It is about 10% of total causalities suffered by UN Peacekeeping missions since inception. Pakistan blood play important role in world peacekeeping mission. Pakistani peacekeepers has given them the honour of being one of the most desired bodies of troops in each UN peacekeeping mission. Published in The Asian Telegraph on December 21st, 2018. Writer is a Senior Journalist, writes regularly on National & Internationally issues especially on CPEC/ OBOR.